Click here to view Ben Stern’s newly released IvyAchievement International Financial Aid and Admissions Guide! The IvyAchievement Finance Employment Index, which reflects representation of graduates at the top finance employers. 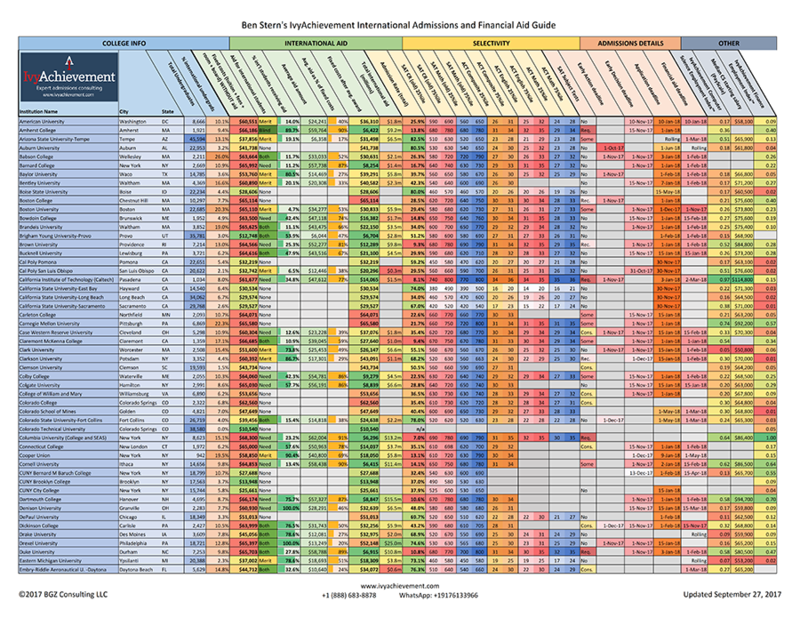 Additional pages comparing the most generous schools and ranking the top schools for CS, finance. College profile and admissions data were sourced from U.S. Department of Education Integrated Post-Secondary Education Data System (IPEDS) and Common Data Sets released by schools where possible. (2016-2017 was used in most cases, but 2015-2016 is the most recent available for some school.) Some information comes from U.S. News & World Report Compass™. We used our judgement when there were discrepancies among these sources, giving preference to primary sources unless there was obvious error. This list is expansive but not exhaustive. There are additional schools that offer financial aid to international students, notably schools closely affiliated with various religious denominations; however, we chose not to include them because of their narrow appeal. Some of the schools listed may offer aid only to beneficiaries of the Deferred Action for Childhood Arrivals (DACA) program and state equivalents; we removed schools where we ascertained this to be the case, but please make sure you are eligible for aid before applying to any given school. Also, deadlines can change, so please make sure you are applying on time! The IvyAchievement Computer Science Employment Index™ (CSEI) and IvyAchievment Finance Employment Index™ (FEI) are derived from employment data on LinkedIn and PayScale. Data was collected directly from PayScale where possible, but U.S. News & World Report Compass™ was used in a few cases. Please email any questions, comments, or corrections to international@ivyachievement.com. What are you waiting for? View now!